Below are some of the articles I found helpful in helping me understand more about topics such as Leadership, Employee Engagement, Staff Retention, Building a Strengths-Based Culture and understanding Millennials. Learn more about the Strengths-Based Philosophy and the CliftonStrengths (Gallup StrengthsFinder 2.0) tool. Simply click on the thumbnails to download the papers! Want to skip to the relevant sections? Just click on the tabs. Great leadership is dynamic; it melds a variety of unique skills into an integrated whole. Great leadership is also founded in good habits. What follows are the essential habits that exceptional leaders rely on every day. 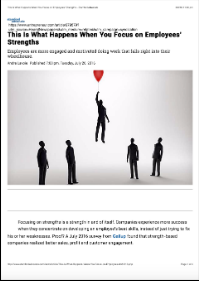 According to Tom Rath and Barry Conchie, strengths are what make leaders great. We all have natural talents, of course, but the greatest leaders are highly aware of theirs. They know what they’re good at and spend countless hours making themselves better at what they do best. What sets the great boss apart from the average boss? Little has been said about what happens in the thousands of daily interactions and decisions that allows managers to get the best out of their people and win their devotion. What do great managers actually do? Six times Google has topped Fortune magazine’s list of the 100 Best Companies	to Work For. Most people assume that Google tops the list because of their great benefits and all of the fun and perks that they pack into the Googleplex. But that’s just part of the equation. 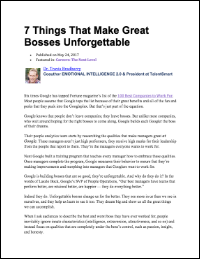 Google knows that people don’t leave companies; they leave bosses. Google builds each Googler the boss of their dreams. Companies fail to choose the candidate with the right talent for the job 82% of the time, Gallup finds. 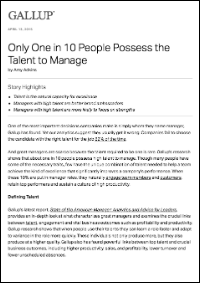 Gallup's research shows that about one in 10 people possess high talent to manage. When these 10% are put in manager roles, they naturally engage team members and customers, retain top performers and sustain a culture of high productivity. The need to dramatically change the way employees are managed couldn't be more urgent. 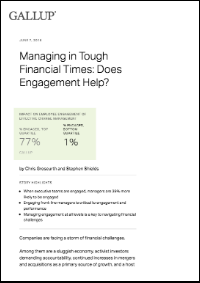 Gallup estimates the cost of poor management and lost productivity from employees in the U.S. who are not engaged or actively disengaged to be between $960 billion and $1.2 trillion per year. Organizations count on managers to deliver the results they need. 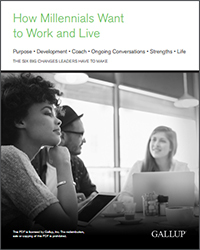 For companies consistently struggling with employee performance issues, this study provides nourishing food for thought – areas for senior executives and HR to focus on as they develop their own managers. Recent research points to several effective methods to improve productivity and profitability, and none of them rely solely on reducing headcount. To maximize performance, you need both engagement and ability. Recently I was talking with a new manager about the team she had inherited. While she thought that most of the team members were doing a good job, she was concerned that one or two people were not pulling their weight. She wasn’t sure what to do about them. The more complicated life becomes, the harder it is to define success. As in: You’re crushing it at work, earning one promotion after another, but you’ve barely seen your kids in weeks, and honestly, you don’t feel so great about yourself. And on the flip side: You stay at home with your kids every day, watching them blossom into happy, healthy little people, but your entrepreneurial potential is being left untapped, and you don’t really feel fulfilled, either. At work, leaders with higher levels of self-control display more effective leadership styles – they are more likely to inspire and intellectually challenge their followers, instead of being abusive or micromanaging. Analyzing more than 120 management papers, we found that there are three main reasons why people occasionally lose self-control. Instead of being penalized for needing time to process a difficult life change or illness — or even to attend a child’s soccer game — we believe managers should encourage taking the time to have a rich life outside of the cube. The best thing managers can do for all their employees is to do the hard work of actually evaluating performance, not chair time or face time. When managers do so, they free employees to arrange their work lives so that they can be the most effective. 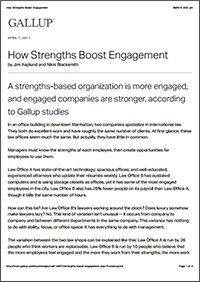 A strengths-based organization is more engaged, and engaged companies are stronger, according to Gallup studies. Only 11% of employees worldwide are engaged in their jobs, according to Gallup. That's an alarmingly low number and suggests profound problems for workplaces in almost every corner of the world. Low engagement results in lower productivity and profitability -- and damages a company's future prosperity. 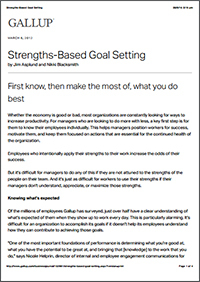 One significant, tangible way to boost engagement is to help employees know their strengths. Gallup discovered the first secret years ago: Employee engagement boosts organizational performance. 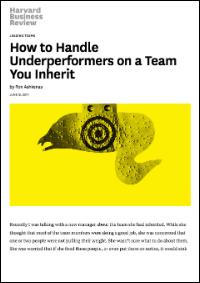 The second secret came from subsequent Gallup research: People who know and use their strengths -- and the companies they work for -- tend to be better performers. Many companies continue to struggle with advancing and retaining women. We have found that gender disparities in our senior cohorts are not completely explained by traditional workplace concerns, such as work-life balance, maternity leave, unequal pay, and differential ambitions. We have identified a very different explanation, which is just as critical. For managers who are looking to do more with less, a key first step is for them to know their employees individually. This helps managers position workers for success, motivate them, and keep them focused on actions that are essential for the continued health of the organization. Employees who intentionally apply their strengths to their work increase the odds of their success. 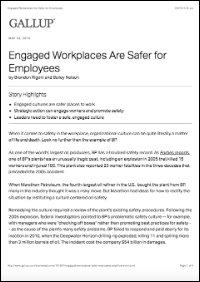 To create a culture focused on safety, leaders should implement targeted actions to improve engagement in the areas with the strongest links to safety. Organizations with top-notch safety cultures have the following in common. Focusing on strengths is a strength in and of itself. Companies experience more success when they concentrate on developing an employee’s best skills, instead of just trying to fix his or her weaknesses. Proof? A July 2016 survey from Gallup found that strength-based companies realized better sales, profit and customer engagement. 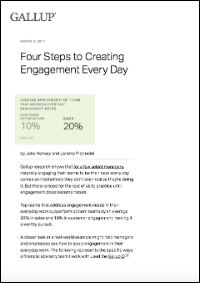 Top teams that address engagement needs in their everyday work outperform bottom teams by an average 20% in sales and 10% in customer engagement, making it a worthy pursuit. 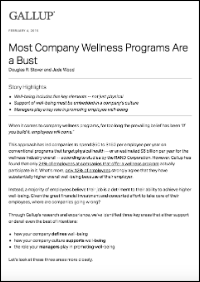 Gallup has found that only 24% of employees at companies that offer a wellness program actually participate in it. What's more, only 12% of employees strongly agree that they have substantially higher overall well-being because of their employer. Leading a company through challenging financial times and rapid change requires engaged executives and committed employees with the right talents and strengths to solve business problems and optimize performance. For change initiatives to succeed, leaders need to engage employees at all levels. The percentage of disenchanted employees in Singapore increased somewhat last year, and the trend should be a cause of continuing concern for the country's business and government leaders. Their disenchantment adds up to billions of dollars in lost productivity for the country. 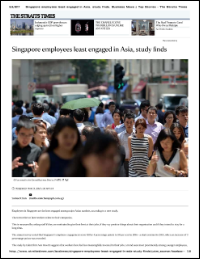 Employees in Singapore are the least engaged among major Asian markets, according to a new study. The term refers to how workers relate to their companies. This is measured by asking staff if they are motivated to give their best at their jobs, if they say positive things about their organization and if they intend to stay for a long time. The world has an employee engagement crisis, with serious and potentially lasting repercussions for the global economy. Though companies and leaders worldwide recognize the advantages of engaging employees, employee engagement has barely budged in well over a decade. You can't create a strengths-based organization unless your company is totally committed to doing it. Here are three steps executives and managers must take. Many organizations have found that strengths-based employee development can lead to an engaged and productive workforce. These organizations begin their strengths-based initiatives by helping employees identify their strengths. Then managers help employees align their strengths to the responsibilities and expectations of their roles. 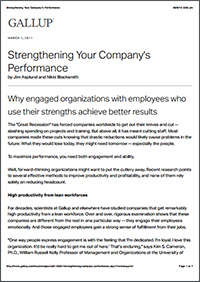 In working with hundreds of organizations, Gallup uncovered the characteristics common among companies that have accomplished the most with their strengths interventions. 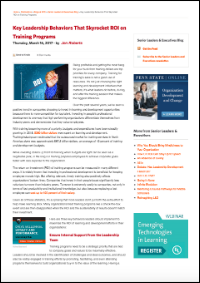 This article focuses on one of these strategies: internal communication. Only 13% of employees worldwide are engaged at work. What's worse is this low number has barely budged since Gallup began reporting engagement worldwide in 2009. Being profitable and getting the most bang for your buck from training dollars are top priorities for every company. Training for training’s sake is not a good use of resources. It's not just choosing the right learning and development initiatives that matters; it's what leaders do before, during, and after the training session that makes the biggest difference. Some individuals, teams and divisions across virtually the entire Fortune 500 are finding ways to talk about and use their strengths. Thousands of people complete the Clifton StrengthsFinder every day. What follows are the steps companies can take to create rich, vibrant cultural tapestries out of their employees' natural dispositions. The most interesting thing about Facebook’s new headquarters is how hard Facebook has worked to preserve the stripped-down, collaborative atmosphere of the workplace that preceded it. 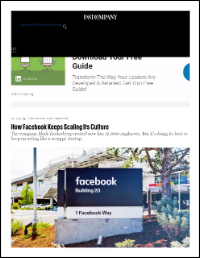 It reflects the company’s obsessive desire to scale up the fabulously successful working environment that Zuckerberg devised in the early years, which is a big part of preserving its culture. If I pay most of my attention to what is not working, I will be perceived as having a more realistic view of my own importance. Thus, I will be perceived as being a humble person. While this appears to be humility, I would like to suggest that it is not. Gallup and other organizations have made enormous advances over the past few decades in developing tools to dramatically improve our ability to see the unseen. CliftonStrengths, which catalogs individuals' talent themes, provides leaders with insight into themselves and their teams in a way that was never possible when I began my career. Given this knowledge, there is no reason why all workplaces could not be strengths-based. Are millennials really that different? The answer is yes — profoundly so. Millennials will change the world decisively more than any other generation. This report found that future leaders’ expectations revolve around doing work that feels worthwhile. Millennials fundamentally think about jobs as opportunities to learn and grow. Their strong desire for development is, perhaps, the greatest differentiator between them and all other generations in the workplace. The young people in your office crave – and respond to – a good, positive coach, who can make all the difference in their success. Overall, Millennials want feedback 50% more often than other employees. They also told us that their number one source of development is their manager, but only 46% agreed that their managers delivered on their expectations for feedback. Consider, for a moment, the challenge Facebook has when it comes to managing its people. Facebook currently has 3,200 employees worldwide. Meanwhile, many of those 3,000 workers are actually 20-something in their first jobs out of college. A number of long-tenured credit union leaders recently announced their plans to retire. But is the industry prepared to welcome the next generation of leaders? The report identified the following big six shifts organizations need to make to recruit and retain the next generation of top talent.